Usir neb Jedu, netjer aa, neb Abju: (t0) Osiris Lord of Busiris, the great god, Lord of Abydos. We’ve been working hard on the first bit of the offering formula. 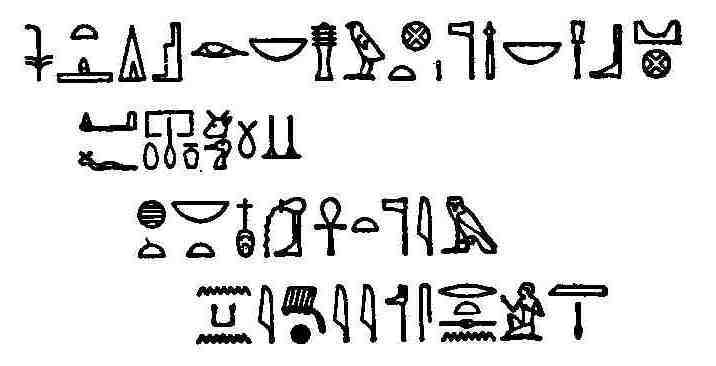 I tell you what; let’s not have a hieroglyphic lesson this time. Put your feet up, and I’ll tell you a story. Once upon a time in ancient Egypt, when Egypt was so ancient that the gods lived on earth, there was a god-king called Osiris. He was married to his sister Isis, which seems odd to us but was fairly normal for Egyptian gods (and their kings, come to that). Osiris was a good king and very useful; he invented farming and taught it to the Egyptians, his subjects. His rule was peaceful and happy. The one who started it in Osiris’ case was his brother Seth. He wanted to be King. So, at a family party (when else?) he tricked Osiris into getting into a coffin, sealed it shut and threw it into the Nile. The coffin with Osiris inside it floated down the Nile, out into the Mediterranean and along the Levant coast to Byblos. At Byblos, it got tangled up in the roots of a cedar tree, and came to a halt. Seth had, however, reckoned without their sister Isis. Isis was a very resourceful goddess-queen, and not only that, a very powerful magician. She was also devoted to Osiris, and had her sister Nephthys, Seth’s own wife, totally on her side. Isis transformed herself and Nephthys into kites (the birds, not the paper flying things) and they scoured Egypt and the East until they found the coffin stuck in the roots of the cedar. They were too late. Osiris was no longer of this world. Isis hid the coffin in the marshes of the Nile Delta, which she organised a decent burial. While she was up to her neck in the funeral arrangements, Seth discovered the coffin by accident, and was so angry that he tore Osiris’ body limb from limb and scattered the bits the length of Egypt. Actually, it must have been more than limb from limb, because he broke it into anything up to forty-two pieces, depending on which version of the story you read. The devoted, put-upon Isis set about clearing up the mess. Someone always has to. She found most of her husband’s bits, except – er – her husband’s bits, which had been swallowed by a fish. Never one to admit defeat, she made him a new one. One wonders whether it was a new and improved one … Anyway, by reassembling Osiris. scattered limbs and bandaging them all together, Isis invented mummification. Isis the magician was able to reanimate Osiris’ corpse, including the aritifically substituted bit, sufficiently to conceive the child Horus, who became the rightful heir to his father’s throne and opponent of his usurping uncle, Seth. You can imagine how Seth felt about that. He was about as much in favour of Osiris having an heir as elderly relatives are when they’re watching the news and the kid comes in an switches channels to the cartoons. Realising the danger to her son, Isis hid him in the marshes until he was old enough to stand up to Seth. In the meantime, Seth searched for Horus until, eventually, they met. The subsequent contendings of Horus and Seth were almost as bad as the battle over the remote control when the Queen’s Speech is up against the Christmas special. Seth did his darndest to trick, seduce, blind, conquer and kill Horus to secure the throne. However, much aided by Isis’ magic, and after a great deal of political wrangling among the gods, Horus eventually succeeded in ascending the throne and Seth was banished to the desert. Never mind. We’ll start tearing him apart – or at least his name and titles -next time. That’ll teach him.